I found some interesting articles at hospitalinfrabiz.com – India’s Exclusive Hospital Infrastructure Business Portal – and thought I’d share them with you. You can read them on their “Hospital Design and Build” page. Of particular interest, I found the summary article “Top 10 Evidence-Based Design Features that Improve Healthcare Outcomes” engaging, as it was co-written with members of the Center for Health Design. Also, I enjoyed reading “Why a “patient-experience specialist” is vital for your design.” It summarizes what a patient needs when they come for treatment. What I wonder about this article though, is will this continue to affect US hospitals given the new public healthcare measures promoted by President Obama? “Family Centered Care” is another article that I enjoyed because it considers that patients are part of a community. I particularly like the questions as the end of the article which could help with the visioning process. This is just a small sampling of 13 articles on the site as of this post. What I like about the site overall, is the references listed at the bottom of the articles. What I’d love to see is how EBD merges the three articles into one design, and maybe even a case study on it. 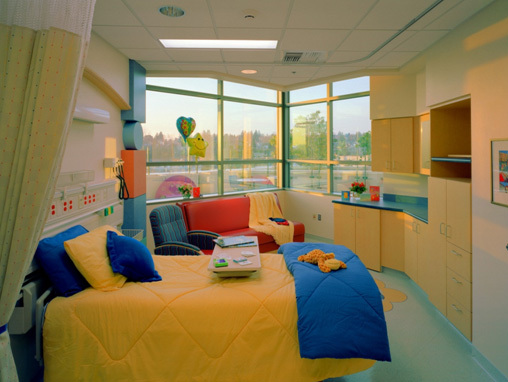 But I’m curious, what other design options would you like to see considered in a hospital?